I look forward to Apple getting into this area and hopefully using sensors that go beyond motion. I've been testing AutoSleep as has my wife and the results seem somewhat dubious to us, to put it mildly. My wife is a poor sleeper often lying awake for hours which all get's logged as sleep. How it can recognize 'deep sleep' from 'quality sleep' based on movement as opposed to electrical read-outs from the brain is a mystery to me. For the price, I am not complaining but I suspect they are just novelty apps until more sensor data can be accessed. or perhaps the Apple Watch is left charging on the nightstand while the beddit product sends it updates via BTLE. I’m curious to know why sleep tracking would require new hardware....other than it’s a way for Apple to get people to upgrade. They might say something along the lines of better battery life, ultra energy saving mode or fast charging. I've using my S4 to track my sleep with AutoSleep and I just charge my AW every other day. Mine lasts 23 hours and 40 minutes on average so I keep it on a night (the night light is very useful at times) and charge it fully each morning while I shower and have breakfast, it charges that fast. Apple has disabled the light sleep vs deep sleep functionality. You should try a different app. SleepWatch does use motion but it also uses your HR to determine your sleep cycles. You never tell it when you're sleeping and I've found it to be surprisingly accurate when knowing I'm both in bed and taking a nap. It even worked on a plane, which I found surprising since that's a lot of constant bumping and poor overall sleep. Very much looking forward to an Apple implementation of sleep tracking. I use other ones but I'm sure Apple will do it right. You should try a different app. SleepWatch does use motion but it also uses your HR to determine your sleep cycles. You never tell it when you're sleeping and I've found it to be surprisingly accurate when knowing I'm both in bed and taking a nap. It even worked on a plane, which I found surprising since that's a lot of constant movement with plane and poor overall sleep. AutoSleep has helped me improve my sleep hygiene //immensely//. Correcting an ambiguity above, AutoSleep definitely and emphatically uses heart rate monitoring along with physical motion monitoring. I also use AutoSleep (works great) and battery life is a non-issue. At night, I set the watch to "Theatre Mode" so the watch face doesn't go on as I move around while sleeping or trying to get to sleep. That likely saves some battery. In the morning, I pop it on the charger (left by side of bed) and by the time I'm ready to leave for the morning it is fully charged. This worked on my older series 3 AW as well. It's easier to simply make that part of my morning routine so even if the battery lasted some number of days, I'd probably charge it daily. When Apple can improve the battery vastly, we will see this addition. I can routinely get 2 days out of my series 3 watch and it charges reasonably quickly with the current inductive charger. I can easily see putting it on the charger for 30 min while you shower and get dressed in the morning and getting enough charge for the day. I don’t use mine to make a lot of phone calls, stream music, etc, however. Something that would be nice is if the watch could monitor for hypoxia. They already have LEDs in the back to sense heart rate. Adding pulse oximetry would be a nice way to screen for sleep apnea. Beyond that, I already know I dont’ get enough sleep - I dont’ need my watch to tell me! Did you read the comments before writing? Third party apps are already available and being widely used without significantly impacting battery life. Apple will do even better. Good to know yet AutoSleep is still wildly inaccurate in our tests. So I stand by my first comment i.e. hoping Apple is delving into more areas than motion and HR somehow. Not sure if I'm in the minority, but I hate sleeping with a watch on. 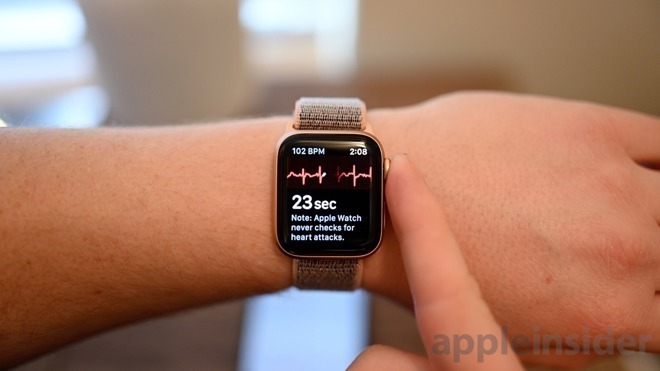 I'd love it if Apple introduced an unobtrusive sensor that can be put on the wrist, ankle, or both. They already have a patent on something like this that they've even developed to include motion monitoring for sports training and tracking. Not sure what's taking them so long to implement a functional application of this idea. What does that have to do with sleep tracking? People use current Watches for sleep tracking now.